With all the elements that go into a successful trade show, it’s difficult to coordinate a unified, impactful display that successfully tells your brand’s story. From signage to print collateral to promotional giveaway items, you need every piece of the puzzle working together. That’s where we come in. Unlike many trade show companies, we aren’t limited to a single product. We work with a wide range of manufacturers of everything from displays to promotional items – so we can always find you the ideal solution for your unique trade show goals. Because we can produce every element – exhibits, signage, print collateral and promotional items – you save time and present a more unified, coordinated image. 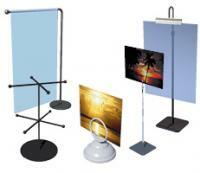 We’ll evaluate your trade show booth size and location to determine the best fit. 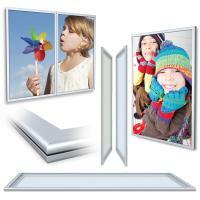 We work with top manufacturers of pop up displays, panel displays, table top displays and more. 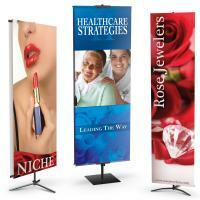 Add visual impact with a banner or sign that communicates your brand message and entices new prospects. 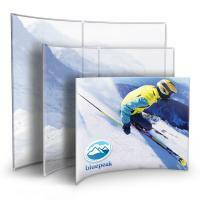 We can create custom vinyl or fabric banners in any format that you desire, as well as supply stands and hardware. The capabilities of most trade show companies stop short of producing creative, impactful sell sheets, catalogs and other print collateral. Keep your trade show presence unified and save time by letting CCI handle your print production and even graphic design. Want creative promotional items that will get noticed? Let us show you the newest impactful products. Because we’re local, we can show you a sample in person, at no cost to you. We can also mock up branded versions of any product using your logo. Browse our collection of thousands of hot promotional items here. Our team of designers and trade show specialists will work together with you to create a completely unique trade show experience for your brand. How can we improve your next trade show?